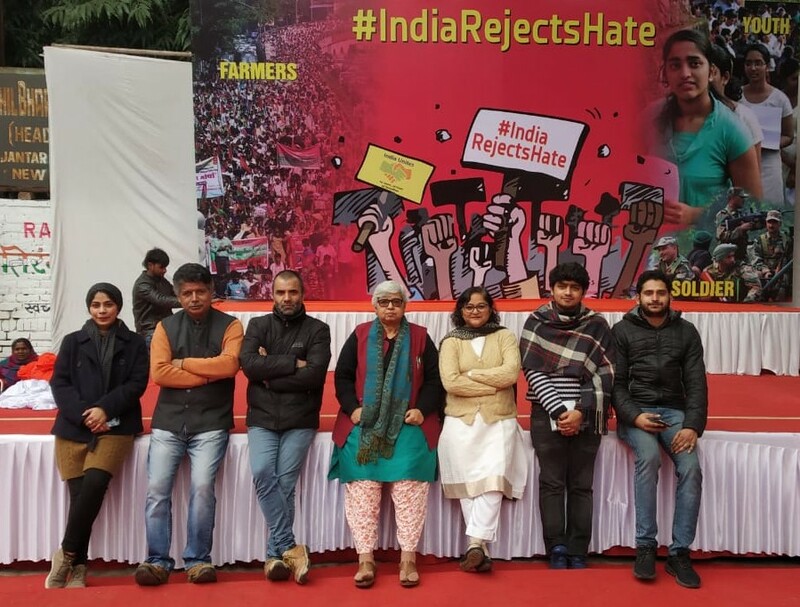 Day 5 of #IndiaUnites saw a strong representation from civil society members who spoke, demonstrated and recited their rejection of hate crimes and bigotry. Hannan Mollah of AIKS flagged off the day with an outline of the 9-day long Agitation. Prashant Bhushan started for civil society, highlighting the good experiences between different communities, which he emphasised was the way to expose (the bigotry of) the BJP and its allies. Advocate Tehmina Arora (ADR) then reminded that our Constitution guarantees the right to practice and propagate any religion, in contravention of which Christians are facing a lot of diatribe over religious conversions. She described how many churched had been shut down, with cases also filed against them. 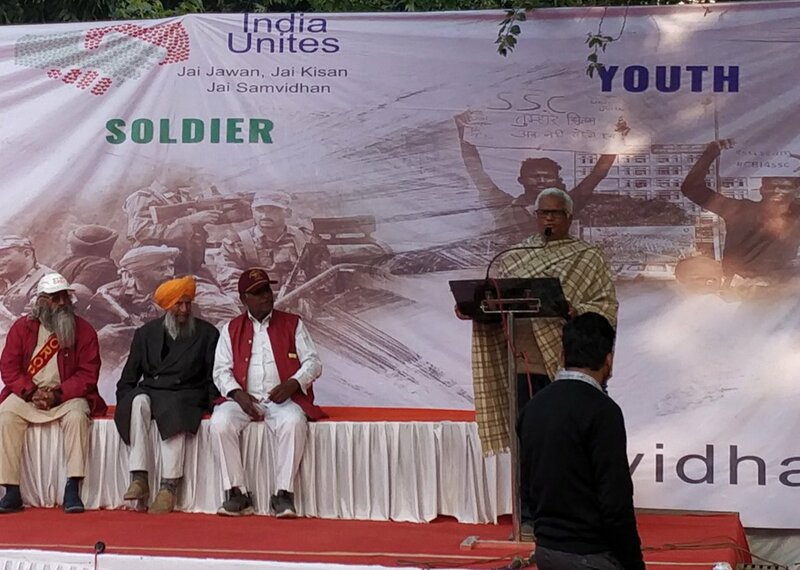 Later, social activist Devendra Bharti spoke about the insecurity among Dalits and Minorities, quoting Gandhi’s desire that our nation should be based on secularism and not become a Hindu nation. Lawyer Manjusha Bhagade elaborated on the way law has been mishandled to suit certain institutions, with Supreme Court orders not implemented in lower courts resulting in a loss of accountability. 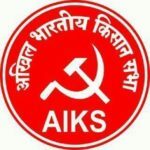 Consultant socialist Anil Pannikar warned about the corruption of people’s minds, which makes them think about hatred and makes them legitimise violence and hatred, while peace activist Ravi Nitesh highlighted the attacks on artists and writers, and how their freedom has been taken away. 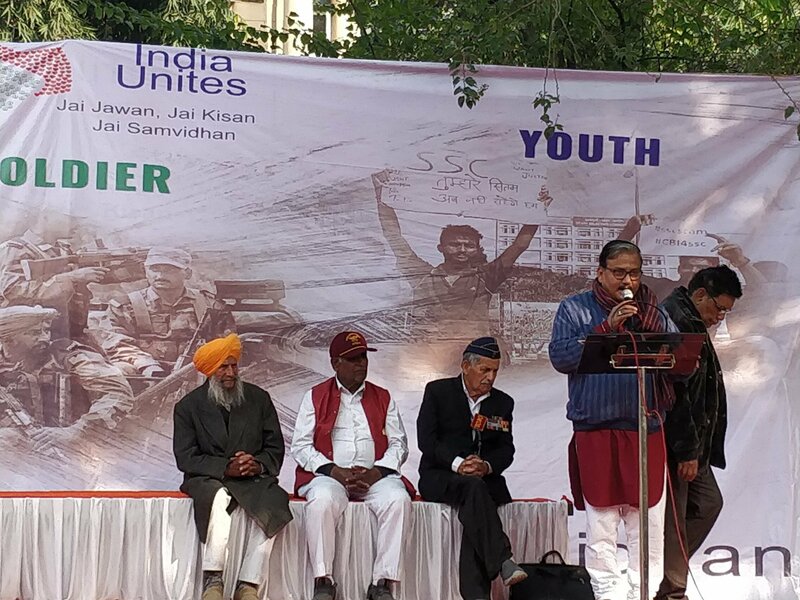 Not in My Name coordinator Rahul Roy also spoke about rejecting hatred, adding that the Sangh Parivar and BJP are at war with the people of India. 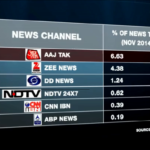 Veteran journalist John Dayal cautioned that it is not just the Minorities who are threatened – even the majority is vulnerable. 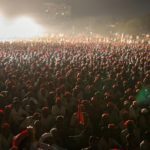 His fellow journalist Shoma Chaudhary added that we need to stand strongly in the ensuing battle of ideas. 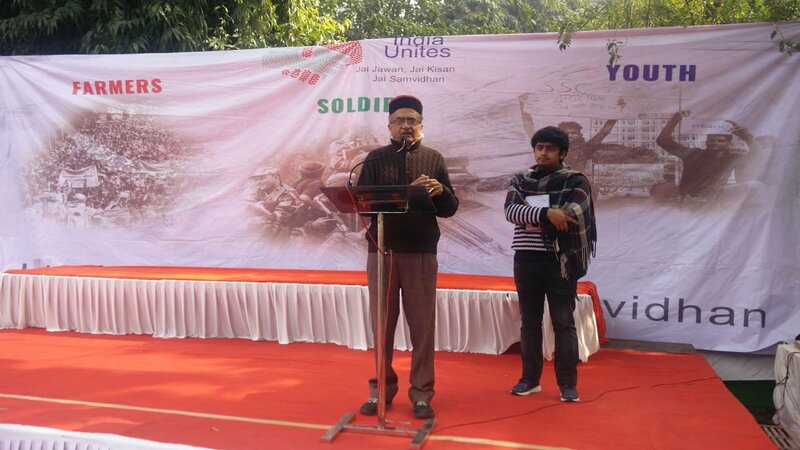 Rajya Sabha MP Prof. Manoj Jha also attended and extended his solidarity, stressing that it was time to come together and shed differences. The day’s performances included revolutionary songs by theatre group Sangwari, poetry by Gauhar Raza and Ashok Kumar Pandey. 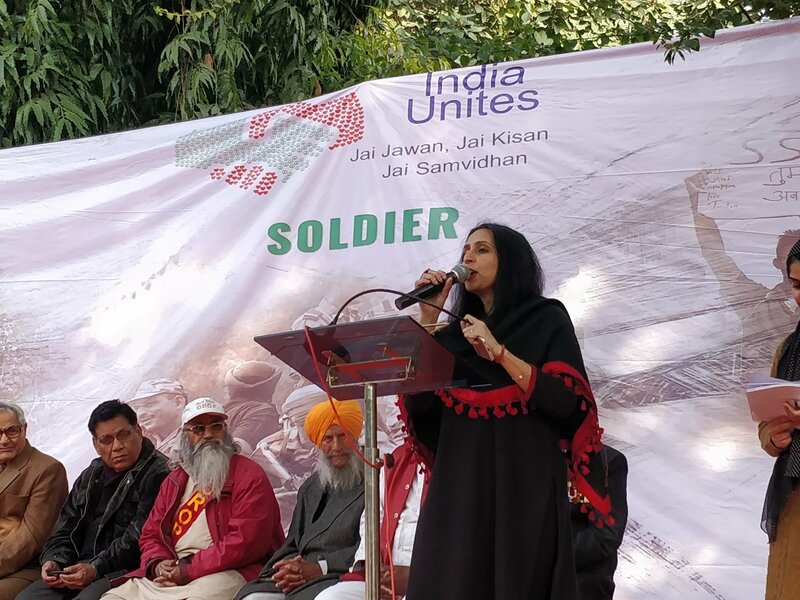 Student activist Pooja Shukla, Navaid Hamid (President of All India Muslim Majlis e Mushawarat), Michael Williams (Director, Mount Carmel Schools), social activist Sandeep Pandey, and writer Sheeba Aslam Fehmi were also among the many speakers who talked about the importance of unity and Constitutional freedoms. 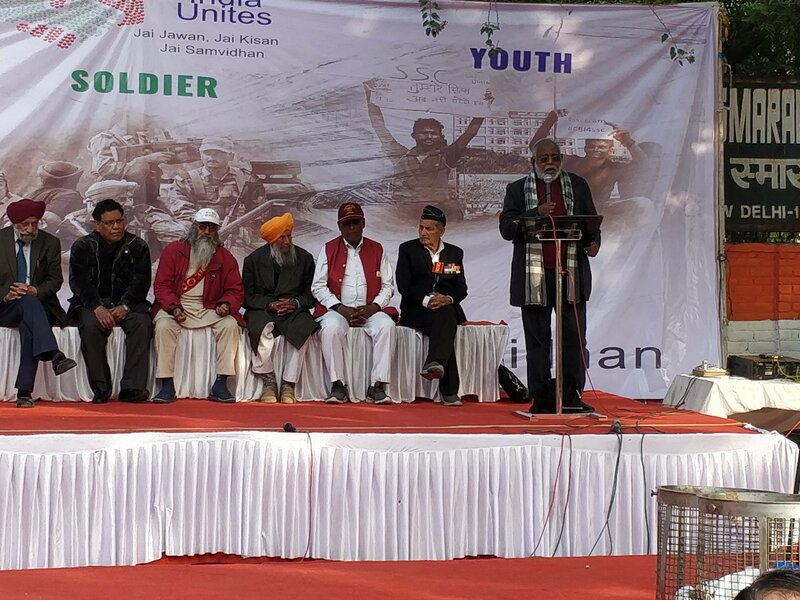 Other speakers for the day included Laraib Akram, Faizan Alam, Rehan Timizi, Ramzan Choudhry, Subhashini Ali, Leena Dabiru, Sehba Farooqui, Maj. Gen. Satbir Singh, and Hansraj. The anchors for the day, Deshdeep and Ena Zafar did a fabulous job weaving the event together. 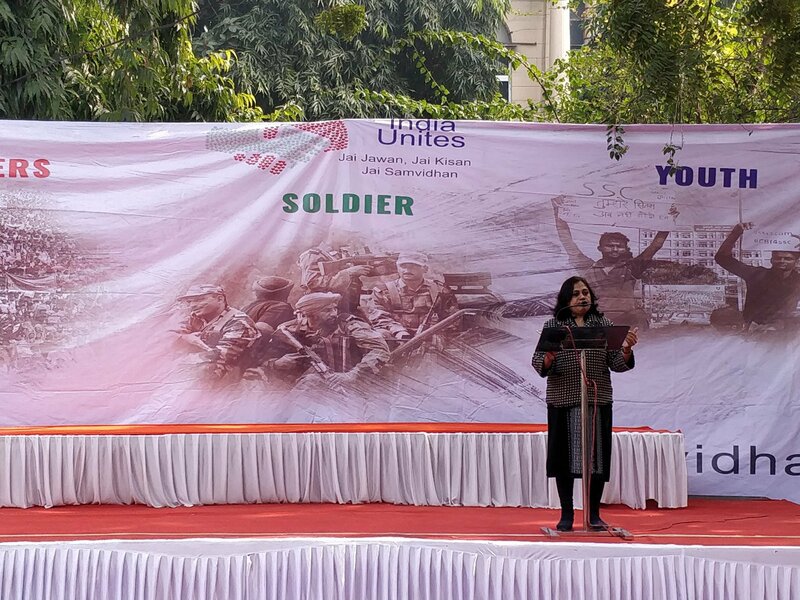 The event was brought to a close by Gandhi Peace Foundation head Kumar Prashant along with Hannan Mollah. 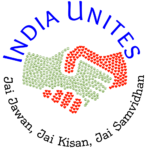 Tomorrow, Feb. 4, #IndiaUnites for its scientists, unorganised workers, and traders; its environment; and against Aadhaar-enabled surveillance. 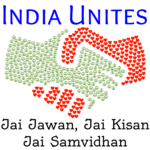 See you all at Jantar Mantar!